We were just tickled to join the mess (about 80) of KIA employees, Cherokee residents, Woodstock officials, media representatives and friends and family that gathered Monday to celebrate the groundbreaking of Carriage KIA. After almost 20 years of working in the automotive field, owner of Carriage Kia David Basha began his career as a dealer in 1994 when he purchased the Nissan dealership in Gainesville from his partners, according to a release. Mitsubishi and Kia franchises were added in 2004 and 2006, respectively. Basha and Carriage Kia are now in the construction phase of the dealer’s second Georgia location, just off Interstate 575 at Exit 9 in Woodstock. Basha thanked his family and Kia team members at the groundbreaking for always sticking by him as they transition into a second location. Woodstock Mayor Donnie Henriques congratulated Carriage Kia on coming to his city and choosing what they believe is a great place for business. Executive Vice President of the Southeast Region for Kia North America Percy Vaughn said his team is deeply grateful for their sales success that Kia has experienced for the last 21 years. Carriage Auto Group and the dealers that comprise it have been awarded numerous awards throughout the years, including the highest rated dealerships on DealerRater.com, Five Star Dealer Award from Edmunds.com, awards of excellence from all manufacturer partners including multiple President’s Club awards from Kia Motors of America and special recognition for hitting sales performance objectives. Basha was the first client of BG AD Group president and CEO Darien Southerland. The two have been working together in that fashion for four years and Southerland said he has been fortunate to represent Basha for about eight or nine years. 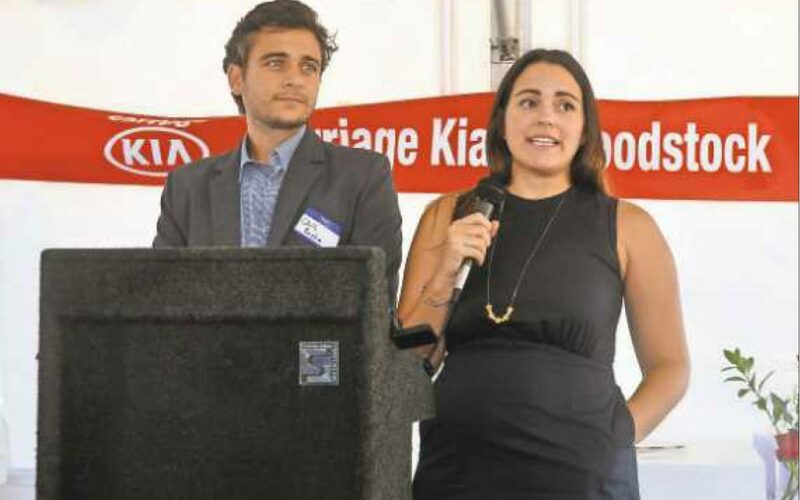 Basha’s two children took the podium, expressing their gratitude and excitement to start a new chapter in Woodstock. Chris Basha said the company will not only help the community of Woodstock with future business, but give back to the community as well. “In addition to bringing a breath of new career opportunities to this community, we will strengthen our ties by working with local nonprofit organizations, hosting family friendly events, seeking out local sponsorship opportunities and supporting local business,” he said. David Basha ended the groundbreaking ceremony with words of encouragement and a promise to the Woodstock community.